← My cover is here! Make every day #IntersexAwareness Day! Today is Intersex Awareness Day, and I’m so happy to have been over on the Androgen Insensitivity Syndrome – Differences in Sexual Development (AIS-DSD) Support Group blog to talk about my experience at their annual conference this last July. Things they teach you in surgical residency: The best way to sew subcuticular stitches. How to place a central line. How to perform laparoscopic (keyhole) surgery. Things they don’t teach you, except by trial and error, in a sink or swim fashion: Empathy. How to talk to patients about difficult topics. How to connect them to people who understand what they’re going through. …the most important thing I brought away from the conference was that sometimes community is the strongest medicine. I hope that None of the Above will not only increase intersex awareness, but that it will change the way that doctors listen to and empathize with all of their patients. And if it makes one person who reads it feel that they are not alone, I will have done my job. 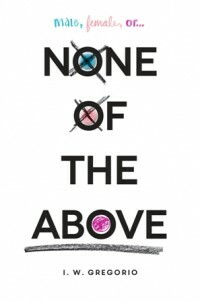 A lot of you have asked how you can get an Advance Reader’s Copy (ARC) of None of the Above. Here’s your chance! 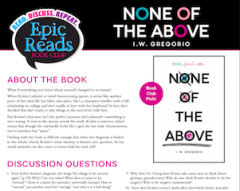 The first FIVE people who donate $100 to the AIS-DSD Support Group will get a signed ARC of None of the Above, and assorted SWAG including a “True love doesn’t care what your chromosomes are” bookmark, stickers, and a We Need Diverse Books button! Your donation will help spread #IntersexAwareness, yes, but more importantly it will help the hundreds of intersex individuals out there who need so badly to know that there’s someone out there who knows exactly what they’re going through. Finally, for an amazing interview and animated video on what it’s like to be intersex (including how important it is to connect with others who are), check out this article about Inter/Act Youth‘s Emily Quinn on MTV.com. Check out her interview below… it could be a trailer for None of the Above.